Hello I am Violeta Scrap and I am delighted to be back here to show you a new layout. 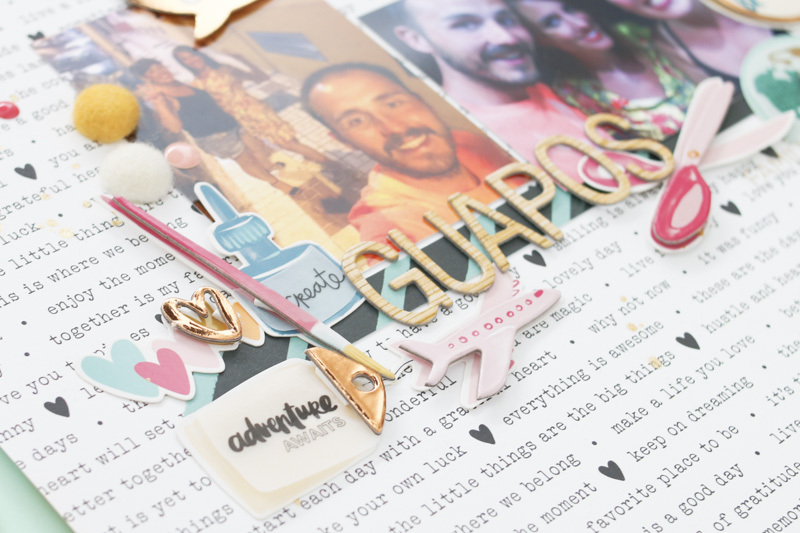 To do this layout I have used different elements from the collection “Hustle & Heart” from Amy Tangerine. As a base of the project, I have used a paper that has different sentences on it. It is great! And I have used two photographs of my holidays of last summer with my family. I have placed a stripe of paper and over it I have glued the two photographs. As the two photos have different colors, I have used color blue with colors black and white as main colors of the project. Moreover, I have used white and pink in different decorative elements of the layout. For the title of the project I have used the alphabet thickers of an old collection of Amy Tangerine and I have put some decorations to create the layout. I have also added some felt decorations and some enamels in different areas of the layout. Finally, I have added some drops of golden ink to create a fun effect in the project. I hope this layout will be some inspiration for your holiday pictures. Also, Amy Tangerine’s collections are perfect for any season because they are full of colors!